I just got back from a wedding where the groom had a Death Star groom's Cake. Yes. 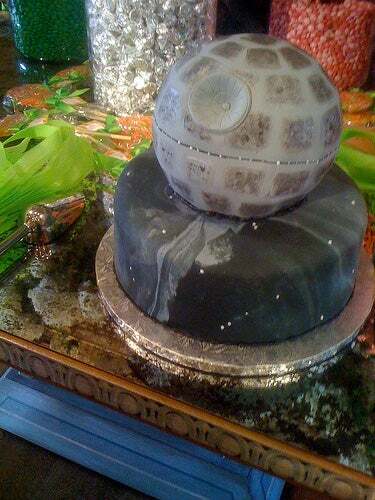 A Death Star wedding cake. Now, I know there are fanboys everywhere, but come on people. Heck, yes, I admit it. I'm guilty as charged, your honor. But although I was willing to pilot the X-Wing rocket (on retrospective, I'm glad that didn't happen), and I know the first trilogy backwards, forwards and inside-out, I've never dressed up or played lightsabers, re-enacted scenes or been to conventions. At most, I played Larry Holland's X-Wing and TIE Fighter simulators when I was in college. And, of course, built Star Wars LEGO stuff. And while I may have suggested to Addy that we should go and live in an Ewok village, I would have never, ever have subjected her to a Death Star wedding cake. Seriously.